Whether your company resides in Silicon Valley or a random suburb of New York, it needs a WordPress technology theme to get the word out to people all over the world. The interesting part about running a tech company is that, typically, the main goal is to expand your reach to users from all over the place. Putting a focus on local customers may be a good starting point, but app sellers, tech blogs and IT companies most often want to find customers who are in different towns, states and countries. After all, a tech business should have that luxury, since you don’t really need to be right down the street to sell something like an app or a hosting account. Therefore, a tech firm needs to put lots of time and money into a website that shares information about a product or service. However, you can minimize those costs with the help of some WordPress technology themes. What To Look For In Such Themes? The whole idea is to locate a template that offers modern elements, along with strong support for items like pricing tables, media, shortcodes, and spots that inform people about what they are going to pay for. It’s also not a bad plan to have an area to talk about the people in your business. Along with responsiveness, and tools that allow for customizing your site quickly, the ideal setup for a tech company is a theme that’s not going to conflict with code changes and plugins. After all, you’re bound to complete actions like these, so you’ll want to ensure that the performance of your site remains solid as you move through the development process. 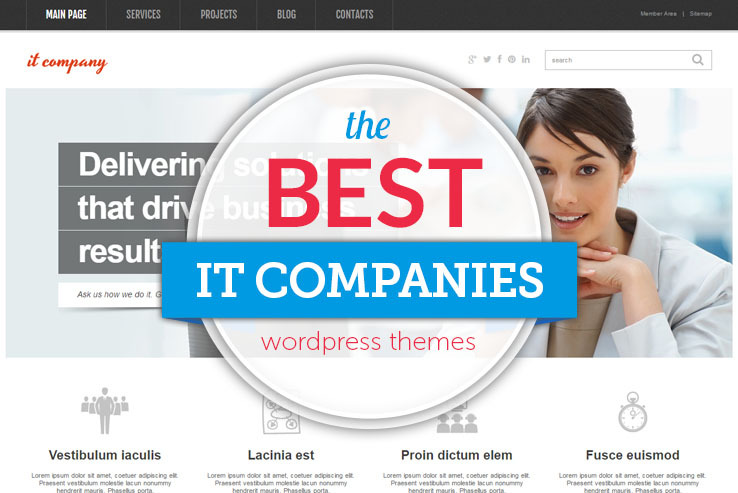 Since lots of WordPress technology themes are available on the internet, we made a list of the most reliable ones. Feel free to bookmark this page and come back when your clients are interested in a new look. We enjoy the Scribe WordPress theme because it has multiple purposes, expanding the amount of businesses that can use it. The WordPress theme comes with a page builder, speeding up the design process from the start. In addition to that, it provides an AJAX gallery for highlighting images of your technological products in a reasonable fashion. For example, many of the tech companies that download this theme are looking to sell apps. As you may have noticed on the Apple Store, the more popular apps are always complemented with a huge gallery of instructions, features, and pages. Therefore, it’s beneficial to have a gallery on your website to give people an idea of what the app does, all without slowing down your website. The Page Builder is completely set up as a drag-and-drop interface, meaning that even a beginner can easily design any type of layout. The responsive design is great for smaller devices, but we particularly want to highlight the fact that it comes with dynamic headers. These are not as common as you may think on WordPress themes, so it’s interesting to see such an easy header solution on a theme. Several animation tools are included for bringing your design to life and the retina icons are perfect to highlight listings about your products or services. In addition to that, the Revolution Slider plugin is included with the Scribe theme, offering a stunning interface for making your own slider, while also integrating wonderful features for areas that have overlaying buttons and text. Since tech companies are often linking to app stores and other areas, it’s nice to quickly show people where they need to go next. A portfolio is included with the theme, and the app showcase is one of the sleekest ways to show off images of your app. Not to mention that if you sell quite a few apps on your website, this can serve as your app library. 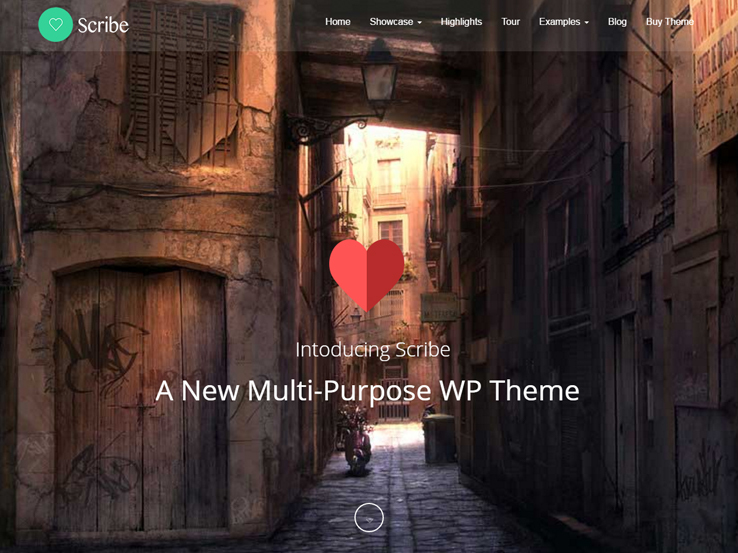 Demo content and documentation is all delivered upon purchasing the Scribe WordPress theme, so give it a try and you won’t be disappointed. Many companies have used this theme in the past, but the customization tools are so strong that it’s hard to identify this theme once you’re completely done with customization. If you’re interested in making a tech magazine or blog, the MH Magazine WordPress theme is a solid place to start. The responsive layout looks great on smaller devices and this comes into play quite a bit nowadays since you can expect many of your readers to look at your articles on their mobile devices. Along with that, several ad spaces are included with the MH Magazine theme, offering a beautiful way to bring in more money for your efforts. Feel free to post your own ad banners or consider utilizing the Google Ads. The unlimited color options are ideal for branding your website and the drag-and-drop interface works nicely for all magazines, considering you don’t want to waste time when writing and formatting articles. If you’ve worked on a magazine in the past, you know exactly what we’re talking about. The custom menus assist in guiding people through your site, while the content slider is exactly what you need for scrolling through a combined set of images. The theme provides a custom logo image area towards the top of the website and it’s pretty easy to change it on the backend. Unlike many other magazine themes, the MH Magazine theme provides a few handy social media buttons. Some of them are more for getting people to follow you on social networks, but others are great for prompting users to share your content online. Much of this theme is built on widgets, so the entire homepage is pretty much a drag-and-drop interface, even if you’re not using the Page Builder. For example, one of the widgets is a sliding carousel, and all you have to do is drop it somewhere on your page to see a sliding list of images that link to your blog posts. Custom footers and widgets combine together to make a fairly informational area towards the bottom of the website. 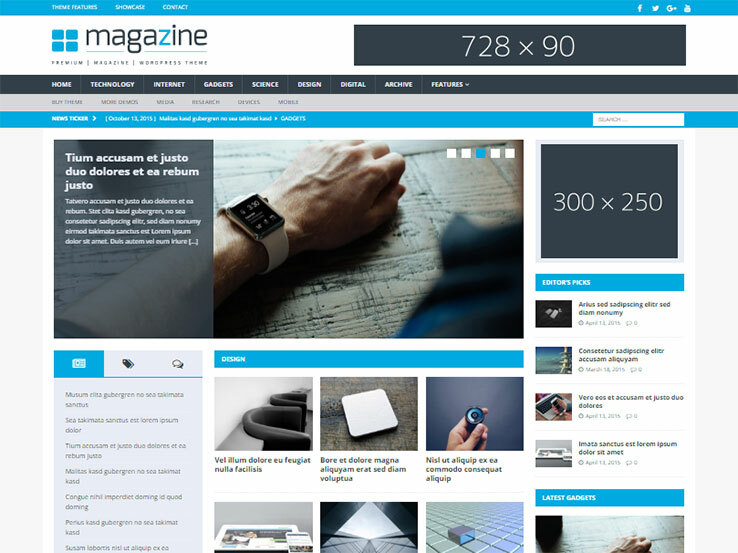 Overall, the MH Magazine WordPress theme is one of the favorites on this list. We wouldn’t use it for an app seller or IT company, but it’s essential for those interested in launching a magazine. 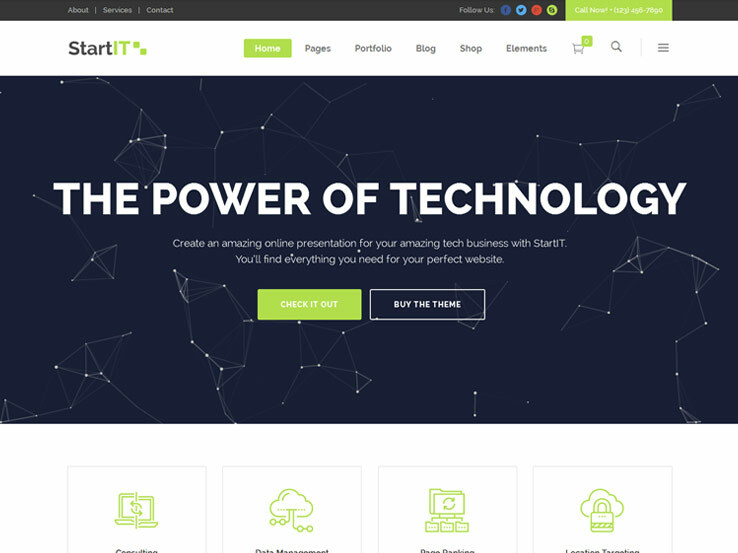 Startit is a gorgeous technology theme with 21 different homepage layouts, various portfolio and blog layouts, and loads of shortcodes that allow you to create the perfect website for your tech startup or an app. The demo content can easily be imported with a single click which allows you to get the look you want without spending hours trying to get the theme to look like the demo. Show off your best work or your products features with a stunning Layer Slider and use shortcodes to add interactive elements such as animations, buttons, 3D showcase, team members, services, testimonials, and more. The theme is very easy to customize thanks to the Visual Composer plugin which provides a drag-and-drop interface for modifying page layouts and use predefined page layouts to make sure all the important pages are included in your website. Finally, you can rest assured that your website will look great on all devices thanks to the responsive design. IT Consulting is the perfect choice for an IT consulting company. The theme features a large header which can be used for a slider to feature your recent blog posts or your most important pages. Right below, there’s plenty of space to insert information about all the services you offer as well as feature clients you’ve previously worked with. 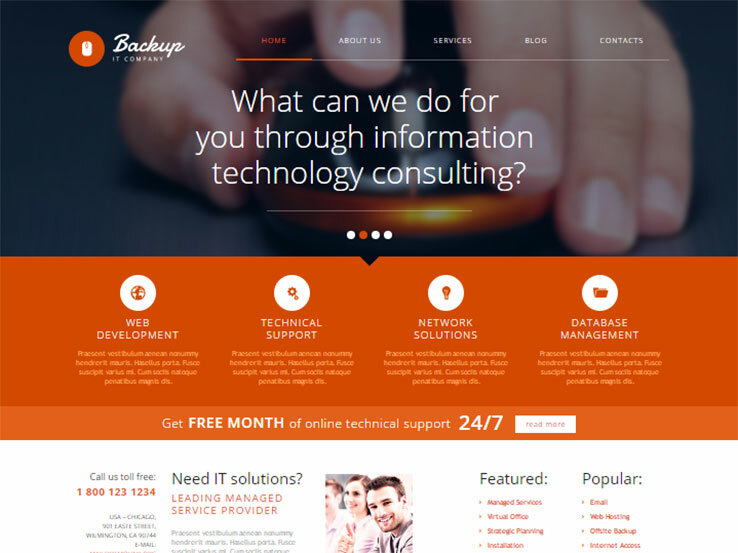 The theme has plenty of white space to highlight your content. IT Consulting includes a filterable portfolio so your visitors can instantly see the projects they are most interested in. The theme is fully editable so you can customize every aspect of your website from colors to backgrounds. Shortcodes allow you to add extra elements to your pages such as buttons, accordions, sliders, and more. This theme is fully responsive and includes translation files so you can easily translate your website into any language. 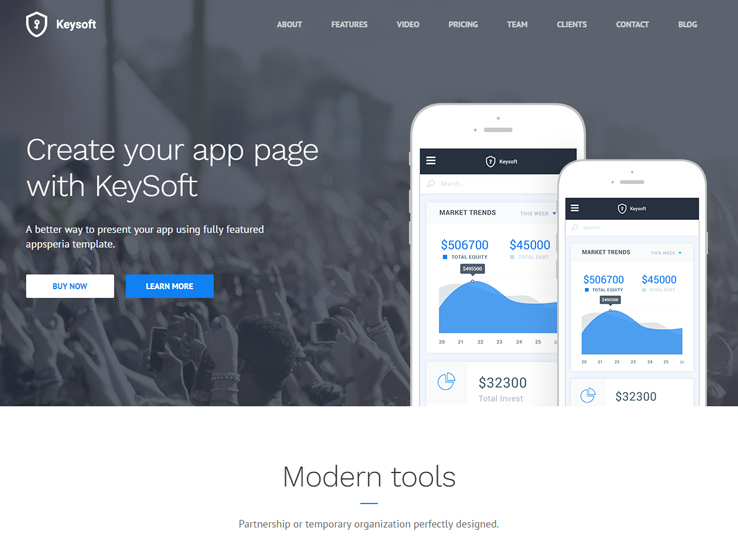 On some occasions, you need a professionally developed landing page to showcase your app in front of your audience. In that case, KeySoft could be an excellent choice for you. It features a fully customizable design complemented by smooth scrolling, which takes the user experience to a whole new level. Multiple header variations and unlimited color schemes make it a lot easier to control the styling. Regarding typography, you can use any Google font you want. And if you are short on time, you can get started by using the one-click demo import feature. You also get a fully functional contact form with the package. 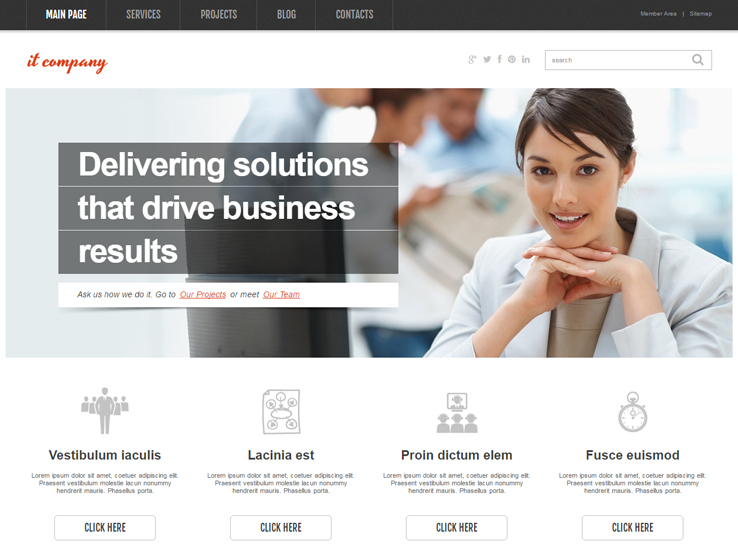 IT Responsive is a dedicated WordPress theme for developing beautiful IT company and tech websites. There are several column-based layouts for publishing posts and pages in different styles. Built-in SEO options will be useful for optimizing the heading tags and metadata of your content. 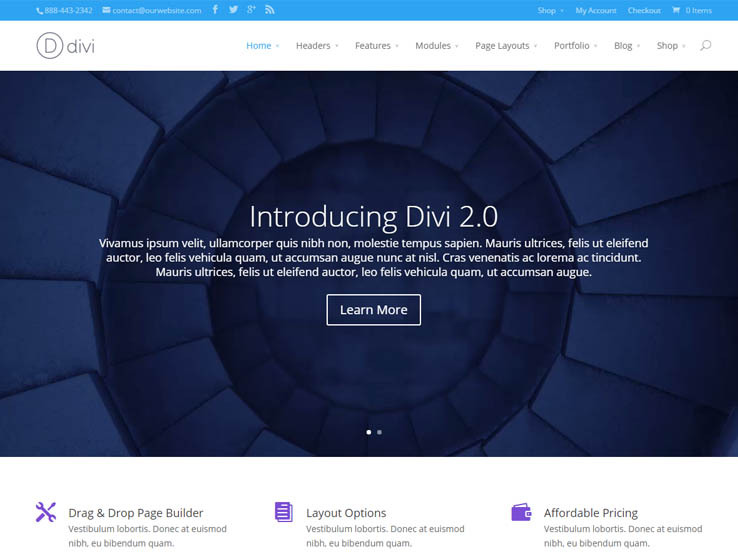 Developed by Elegant Themes, Divi is an impressive multi-purpose WordPress template that can be used to create websites for IT firms, companies, mobile apps, or other relevant businesses. The integrated Divi Builder features 46 content modules and offers an intuitive solution for creating the custom post and page layouts. Divi brings an incredible WYSIWYG editor that allows you to edit your content from the front-end. All the style management options are located in the customizer section. Thanks to the complete RTL support with ready-made translations available in 32 languages, creating a multilingual website will not be a problem. And if you are concerned about security, you can rely on this Sucuri-certified item to keep your tech site secure. 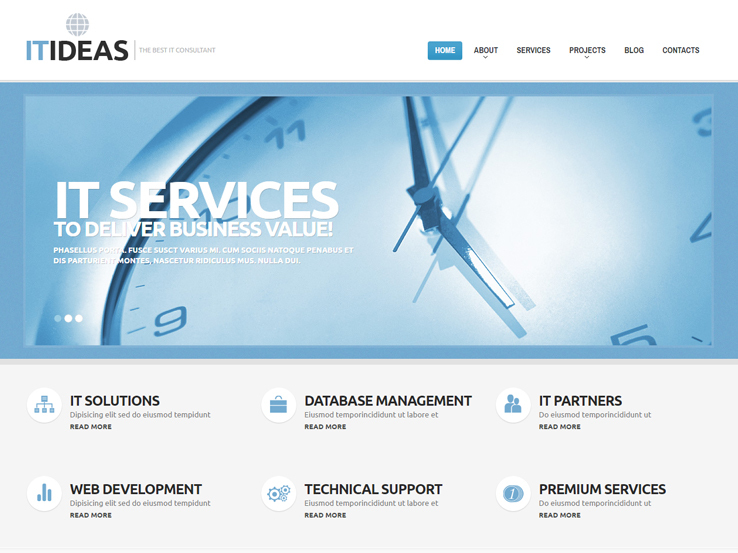 As you can guess from the name, this is a specialized WordPress theme for creating IT company, business, or corporate websites. The compact home page includes essential sections like services, projects, and testimonials, while you can use the header and footer navigation menus to direct the visitors to other pages. IT Company supports multiple languages and offers 80+ custom shortcodes. The mobile-friendly design will make sure that your site works perfectly on any screen size. Other features like the filterable portfolio, custom post types, custom widgets, and SEO integration have made this product a good choice for its price.